Is it beginning to look a lot like winter? Starting to feel the chilly and cold weather? If yes, you might want to take a few moments to buy something to make your little ones warm and cozy. Covering up in a nice baby snowsuit and keeping their feet nice and warm in insulated toddler snow boots are the best ways to keep them warm when Jack Frost is around. Maybe you are planning to travel or just staying home during the cold season. Whatever the choice is, your kids will need a bunch of good toddler snow boots and baby snowsuits. It is a fact that many adults would consider a snowy day as the perfect day to lounge, keep warm and snug on bed or couch while listening to music or reading books. But, chances are the younger ones think the other way. Toddlers and kids are naturally adventurous and fun-loving, and surely they’ll love to make winter a season for adventure. Most especially if it will be your precious little one’s first snow! You’ll love watching them stomping on the snow, trying to catch the falling ones, or just enjoying the sight of a winter wonderland. Whether they’re skiing, sledding, snowball fights, or just doing the old-fashioned snow angels, the right gear is essential to cold-weather fun for everyone. 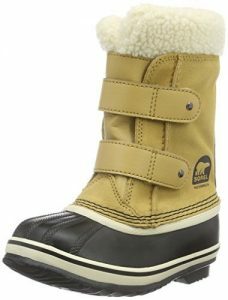 The best thing to do is to keep them warm, safe, and comfy by choosing the perfect snow boots and snowsuits for them. The many options and choices in the market might leave you puzzled and confused, that’s why we’re here to help. 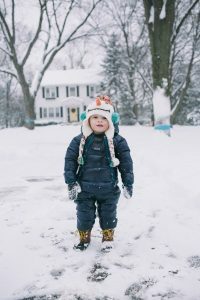 This post will feature the best snow boots for toddlers and baby snowsuits you can get for your little ones. Good pairs of snow boots are as essential as rain boots for steady legs in the snow while keeping little feet nice and warm. If your little kids are stoked to play in the snow, you need to get the perfect snow boots. You would not want a snow play time to turn into toddler-tantrum because of cold, wet and icky feet. So what features do we want to have for our toddlers’ snow boots? Even adults feel very uncomfortable because of cold feet, how much more when it comes to the little kids. Little toes are the most vulnerable to frost bites and the first part of the body to get cold. Frostbites happen after extended exposure to lower temperatures, and you would always want to avoid that. Look for snow boots that are well-insulated with soft lining for a toasty interior for great warmth and comfort. Cold, snowy, and wet feet are terrible and uncomfortable. The material and exterior of snow boots should be able to withstand not only the cold but also the wet, melting snow, and unshoveled sidewalks. Colder versions of puddles of water exist somewhere in the snowy white roads, and you don’t want those cold water to get into your child’s snow boot. Take note that some boots only have a waterproof covering on the foot and not the part up the legs. To be sure your child’s boot is completely weatherproof, look for tight seams and an inner liner that won’t allow water and snow to get in through the laces or other closures. Keeping your kids steady in the snow is very important. Snow boots with good traction and grip are perfect to let the little ones enjoy the snow without having injuries from slipping. There are great chances of slipping and sliding when playing or even just walking in the snowy pavements. That is why it is important that you look for a snow boot with firm gripping soles but are not too heavy for safe walking. Grooved and rubber soles promote reliable grip and stability in the snow. You would not want your toddlers to have a hard time wearing their snow boots all the time. It is a very good feature is a pair is not only easy to wear but also easy to take off as well. Look for snow boots with good openings so that it will be easy for them to slip those tiny feet in. A snow boot that is easy to wear and take off is not only better for your toddler’s independent dressing skills, but also to make things easier for the parents. Lace-up snow boots are good, but velcro and zipper ones are better. The perfect height for snow boots should be halfway up to the calf. This is to avoid moisture or snow to get into the boot while your kid is walking through deep snow. Ankle-length boots might not do the purpose of keeping the snow and cold water away from your kids’ feet. A good snow boot should also be the perfect fit. When buying snow boots, never forget to provide an allowance for the size. They will be most likely wear a thick sock underneath the snow boot, so you may need a size allowance just enough to accommodate them. It is also important that they fit properly so the adequate warmth will be retained inside the boot. Always have your child’s foot properly measured when buying their snow boots. You never want for snow and water to get inside, yet you would love to get the moisture out. There are snow boots equipped with moisture-wicking lining to avoid sweaty and damp feet. This is also to avoid uncomfortable and smelly feet. Columbia brand has been known to produce high-quality gear for both adults and kids. Their boots have been famous for constants keeping the feet warm even when walking on unshoveled snow. 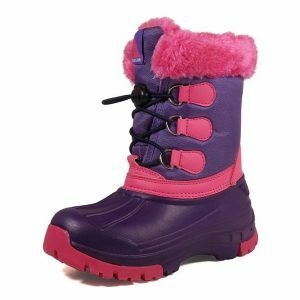 These sporty looking snow boots are both good for little girls and boys who want to explore and have fun under the snowfall. Aside from the ideal features, like being weatherproof and its simplicity, parents also like the Velcro strap that is tight enough to secure tiny feet and legs in. The string at the top part of the boots also prevents lots of snowfall from getting inside. Additionally, the heel part of these little snow boots have reflectors for added visibility and safety. With good traction and grip, the Columbia snow boot will surely keep your toddlers steady on their feet. These snow boots carry festive prints and are also available in plain ones. This snow boot is entirely a great deal for high quality! These adorable and fashionable toddler snow boots allow for a conforming fit that holds during play, and yet avoids the problem of tying laces on the boots. The Sorel snow boot is made from waterproof suede leather with two Velcro straps so that kids won’t have a hard time wearing it and taking them off. 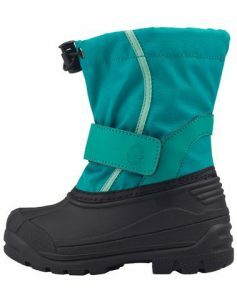 With seam-sealed waterproof construction, you are sure that your kids’ feet will stay warm and dry. The outsole of this boots is made with durable handcrafted vulcanized rubber. For a good grip, these snow boots are equipped with herringbone outsoles. Not only that these shoes are beautiful and classy, but the little kids also love to wear them because they are super comfortable and warm. Mothers claim that their kids wearing the Sorel snow boots seems to not have any trouble with their weight, they can run and play happily without complaining about the boot. 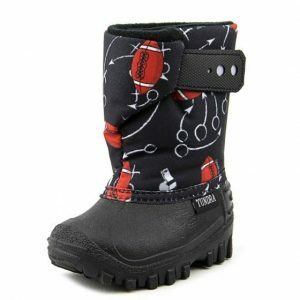 The Kid’s Frosty Snow Boot is one of the most popular snow boots. Not only kids love them but also the parents! The Frosty snow boot focuses mainly on simplicity and good function. Despite its simplicity, the snow boot comes in a very solid and gorgeous design with many color and pattern options to choose from. The outer shell is waterproof, durable and lightweight so kids can stay dry without needing to drag their feet. The closure of this boot is a simple hook-and-loop strap across the ankle for a snug and comfortable fit. 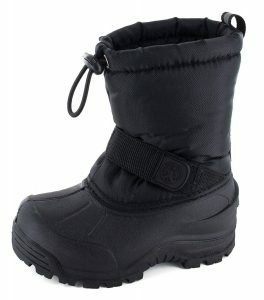 The elastic cinching at the top of the boot ensures that no snow will get into your kids’ feet. It is also a great way to keep those tiny feet warm. The heel pull with a reflective strip effectively helps with getting the Frosty on and off easily. 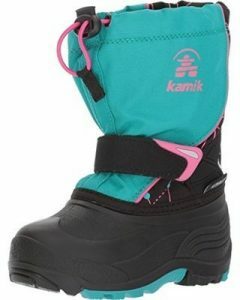 The Kamik snow boots are made with super durable and high-quality textile and rubber. This brand has been a family favorite, and many have claimed to buy these boots for all their kids. The collar of the boot is adjustable through an Easy Grab lace lock, with a velcro fastening, that is also adjustable, at the midfoot area. It also has reflective patches and binding for visibility and safety even in low light. One parent said about how he loved the Kamik boots for their kid. Since, they are waterproof and warms up those little feet. This snow boot is just what they need for their daughter who loves being outdoors. They have been a fan of the brand for a couple of years now. The outsoles of this boots also have good grip, with sealed seams for waterproof construction. It boasts a three-layer feature that wicks moisture, keeps in natural heat in and avoids the chilly air from getting in. All of the materials are made keep your feet totally dry all day long. The Oakiwear winter snow boot caters a molded waterproof thermoplastic rubber sole. This outsole provides great traction for your kids to be stable in snowy and icy conditions. The thermoplastic rubber material is aesthetically versatile and is also recyclable. This boot is very easy to wear with a velcro fastening at the middle foot area and toggle closure at the top part to tighten the boot for warm and snow-free feet. The interior of the boot is made of soft polyester for maximum comfort. It is equipped with 3M™ THINSULATE™, a thin and lightweight product that will keep your little ones warm by trapping and holding body heat. This is a must for cold or wet weather. A custom Oaki Leaf embossed logo stamp on the bungee pull-tab is included. 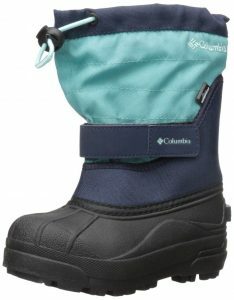 This particular velcro snow boot only comes in black and teal color. These snow boots are winners when it comes to easy wearing on and off. The soles of this boot are very flexible with super soft interior linings so that tiny feet can be very comfortable. The boot opening is a bit wide so it will be easy to slide in and it comes with a hook and loop velcro closure at calf area. The closure is very easy to work with even your kids can wear this boot properly on their own. This snow boot features nylon shaft, rubber toe shell, and fleece lining with a lugged traction for a non-skid and non-slip outsole. It is important to keep your babies warm during the winter season, also make sure that they are comfortable with the snowsuit they are on. Here we give you things to pay attention to when buying baby snowsuits. It is important to get a baby snowsuit that could keep them dry and warm under the snowfall. A perfect snowsuit should let kids and babies stay dry when they’re out playing and making snowmen rather than just keep them warm. When the little ones have fun in the snowy roads, they spend tons of time lying, rolling, and kneeling. That means they may result to soaking wet and cold not just their legs but their whole body as well. Search for a waterproof indicator on the tags, and check the stitches inside the snowsuit, it should be closed from the insides. The phrase “resistant to water” is not a true indicator of a material that is waterproof. Buy the exact and right size for the baby. Getting those that are too large will tend to be heavy and decrease the warmth inside since it would be loose. Choosing a too small size will also cause discomfort and restricted movement which may be frustrating for the babies. This is very important as this is the reason why you are buying the snowsuit. You need to have your baby comfortable and warm so choose snowsuits that are well-insulated. Snowsuits that could provide enough warmth does not really mean that they’ll be very thick. Many snowsuits now come with awesome insulating technology without making the snowsuit too thick or too heavy. It is important to pick the snowsuits with openings that are wide enough for your baby to fit in easily. 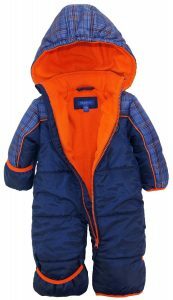 Long zippers that run through the snowsuit, either straight or diagonal, is ideal. A snowsuit should not be a struggle to open and close especially during potty breaks or diaper changes. Zipper pulls are also important, choose those snowsuits with a closing system that’s easy for tiny fingers to work on. Give zipper pulls and drawstrings a gentle pull to be sure they are firm and secure. To your toddlers who are developing their dressing skills, make it a necessity that they can get their dressed on their own. This is an essential factor to consider since adjustability contributes a lot to ease and comfort. Choose snowsuits that can be easily adjusted; an example is an adjustable wrist strap so winter mitts or gloves can be inserted through. Snowsuits with straps and garters that can be adjusted. There are brands that offer a “grow with me” feature where parents can extend the arms and legs from an inch to two by detaching a specially-made seam or stitch in the interiors of the sleeve or leg. The adjustablility feature will let your kid have the snowsuit for additional seasons and will truly be a good investment! The good and high-quality material is an indicator of a durable and awesome snowsuit. A snowsuit made of suitable materials will make a noticeable difference in your baby’s comfort during the winter season. It is important that you choose fabric that will be able to keep your baby warm, but it should be breathable as well. Breathable fabric is important to prevent sweat chills. Always make sure that you don’t get a snowsuit that is too heavy for your baby. Snowsuits that are too heavy will restrict their movements and will increase their chances of falling too. We all know that it can become very uncomfortable too. 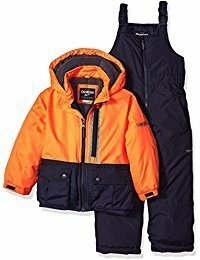 Choose snowsuits that are lightweight but will provide enough warmth too. The Snuggly Bunny baby snowsuits by Columbia are not just cute; they are also very durable and functional. This lightweight snowsuit is totally perfect even in the coldest temperature and heavy snows. This comfy and cozy snowsuit is not only water resistant but wind resistant as well. The material of this snowsuit is very soft and non-irritating. It is made with soft microfleece lining to keep them comfortable. Moms love how the sleeves and pants fold over nicely if needed. 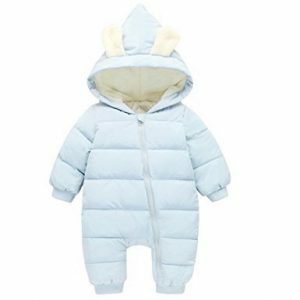 This cute little snowsuit will provide the exact warmth for your baby. They come in cute patterns and prints that will be cool for your baby boy or girl. 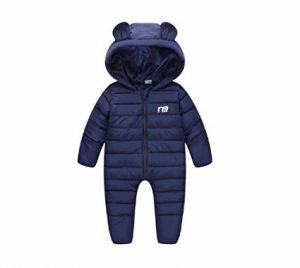 This snowsuit comes only in dark blue and pink color, so the parents won’t have a hard time choosing which color will the baby wear. The snowsuit is super lightweight and soft so that it won’t restrict your baby’s movement. It is also warm enough to protect your baby from the cold and chilly weather. This snowsuit comes with removable gloves or mitts and footwear for complete protection. It is machine washable but do not wash it together with other colored clothes. The snowsuit is double-zippered for easy on and off for easy access during diaper changing. The whole snowsuit set is water and wind resistant, perfect for snow play. This snowsuit set is known to be most parents’ favorite. It’s color combinations are very vibrant, and the little babies will surely love them. It is made of 100% polyester that is safe to be machine washed. The zipper closure of this snowsuit is thick and durable. The jacket has two pockets near the waist and one zipper pocket in the chest. These pockets are perfect for mitts and other trinkets. The Osh Kosh snowsuit is totally perfect to keep baby warm in the snow and let them enjoy the winter season in style and comfort. This is perfect for baby boys who want to experience the beautiful winter season. This outstanding snowsuit is very durable and will definitely keep every baby comfy and warm. Like most snowsuits, this is made with 100% polyester with full and long zipper closure for wide opening. The suit is polar fleece lined and can be easily folded over hands and feet. It is equipped with polyester filling for added extra warmth. The Expedition iXtreme snowsuits are water and wind resistant as well, made with built inelastic in the hood for better fit and added protection. 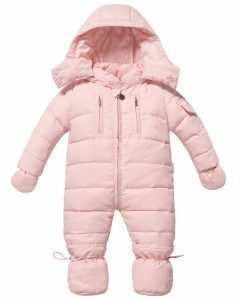 This quilted snowsuit is very cute with tiny little ears on its hood. It boasts a weatherproof outer shell that comes with polyester fill that adds more warmth for baby. This snowsuit is a part of the MA or Motor Active series by 3 Happy Owls. This series is made for active babies that are lightweight and made for easy movement. It has convertible fold-over mitts and attached booties as well. The opening comes as a full-length thick zipper for quick and easy diaper changes. This is the perfect winter snowsuit that is both super cute and functional as well. Lots of moms love the color block detail of this snowsuit, and how it has plenty of room for baby to be comfortable. To keep baby feel totally warm, it also has built-in mittens. Built-in mittens also lessen the worries for lost mittens; this snowsuit also has functional welt pockets. The full-length zipper is hidden with a snap closure. Even with the double style closure, parents never had a problem when it comes to changing and potty breaks. 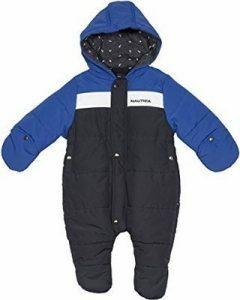 The Nautica snowsuit is machine washable. This Ding Dong Baby snowsuit is overloaded with cuteness. They come in pastel blue and green plus bright pink and bold blue colors. 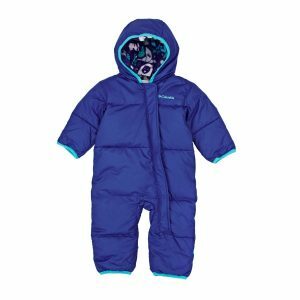 The closure of this snowsuit is a zipper that reaches up to the leg for wide opening and easy changing. Warmth and comfort is never a question when it comes to this snowsuit. This hooded jacket snowsuit provides enough warmth and comfort for your babies while making them look cute too! Handwashing is preferred for this baby snowsuit. Do not overheat or overwrap your little ones. 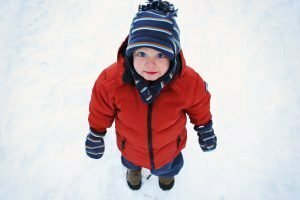 Instead of getting a pair of big boots and snowsuit, large coats, or parka, just think of layering thin clothing underneath, covered with the perfect snow suit, to give comfortable warmth without having your kids sweat too much. Since they move a lot, toddlers don’t have to be extra clothed, either. If you, as an adult, get comfy with a good sweater and coat, it’s very much likely that your little one will be comfortable in the same cold weather outfit. Just give them the right snow boot and the perfect snowsuit, and they will be good to go and enjoy the snow!